For real though I did end up working on this one a bit longer than I intended to, but more on that later (along with future TL plan updates and whatnot). 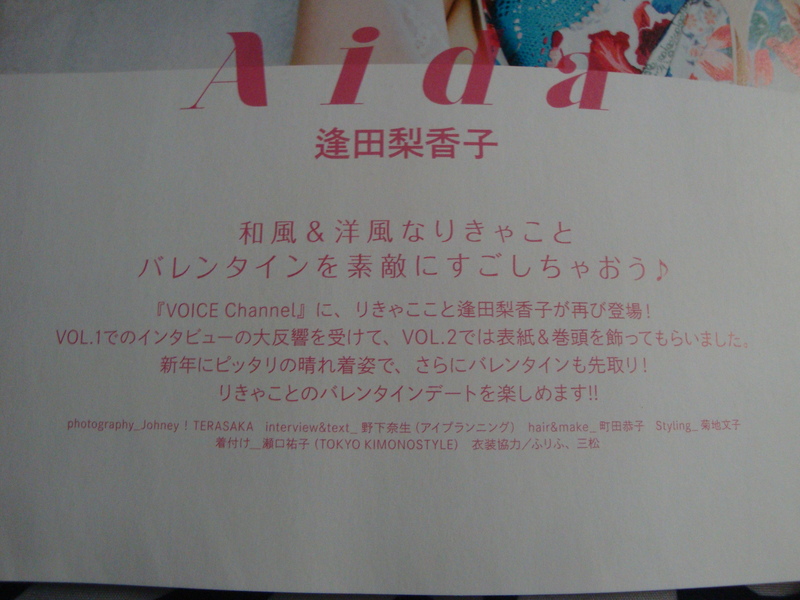 This is the second part to the interview portion of Aida Rikako’s 30-page Valentine’s special for VOICE Channel vol. 2 (first half over here). – words found in parentheses are either words that I put in to clarify certain things, or words that I add to make up for nuances and inferences in the language. Aida Rikako, aka Rikyako, appears once more in [VOICE Channel]. We received a massive reception from the interview she did in VOL.1, so for VOL.2 we’ve now had her adorn both our front cover and our opening feature. Dressed in traditional clothing quite fitting for both the New Year and for an advanced-Valentine’s ! Enjoy a Valentine’s Date with Rikyako !! *Note: Listen. Be amazed. Listen again. ー If anything though, did you and your fellow girl (friends) get really into giving “tomo choco”* to each other during your school days instead if at all? There was something like that, yeah. Just, I’m not very good at making sweets. I just can’t follow the measurements and the procedures written on a recipe. I have been invited by friends before to make stuff, but all I remember was that (what we made) ended up being burnt and blackened things that you couldn’t really give to anyone (´∀｀;). That’s why, even during Valentine’s Day all I’ll ever do is receive, and I was the type to just repay everyone in one go during White Day**. Of course, because I don’t have much creative skill, I gave out store-bought return gifts. ー Why is it that you think you’re no good (at making sweets) to that extent? ー It ends up a failure. Exactly (xD). That “little” measurement of mine is the difference between life or death y’see. I mean, I get it…… for people who are good at cooking, they’d say that so long as you can follow the measurements just fine you can make sweets just as easily as you could any normal dish, but for me making sweets is just astronomically difficult! ー You had a photo shoot of a Valentine’s Date but, if you were to have a Valentine’s Date, where would you like to go? If it’s just a regular date, I’ve always thought I’d want to go to my favorite amusement park but, for (going out to eat) something good…… For this occasion, the two of us going someplace to eat chocolate might be good too. I’m not all too familiar with shops, so I’d be happy if they could introduce me to a good place. Other than that, I’d want to try going to a hotel’s sweets viking*. The sizes of the cakes are compact so you can try to eat a lot of different kinds (of cake), and I also want to try a chocolate fondue. U~n…….. A date at home would be nice I think. I can’t make sweets or stuff like that, but I can cook a meal, like curry or stew, for them instead. I prefer eating meals over sweets after all……. wait, I’ve only been thinking about myself but, is this alright? ー On the contrary, there’s a special feeling to (being cooked for), don’t you think? Well then, this issue would be the first one for 2018. Aida-san, please tell us your resolution for this year. To keep on moving forward, to keep on growing; I feel like these are things that I must do this year, but there’s also the thought that there are things inside me that I should take care not to change. That’s why, for 2018 I will continue to give importance these unchanging things, and I’ll keep doing my best with whatever lies in front of me. I don’t think I can speak of very lofty goals as of yet but; if I can clear one of my goals while I keep on keeping on, the next goal will come up, and little by little I want to move forward like that. – Rikyako’s admiration for Kitamura Eri is well-documented (it has even come up in an interview that I translated before), so it’s nice that she finally got to not only meet her but work alongside her as well. – (pointed out by SilverKanon) This marks another occasion that Rikyako would prefer be celebrated at home, wherein she said something similar about how she’d want to spend Christmas. So yeah, I kinda sat on this one for a while (and it’s not even that long of an interview compared to the others that I’ve done). No real excuse really. Life kinda caught up with me a bit so I figured I’d just take a week off after the last TL that I did. I’d say it’s a luxury of doing these TLs of my own accord, but at the same time this particular translation is technically a request (even gave me scans to work with) so I do feel bad taking so long with it. At any rate, the interview portion is now done, all that’s left is the Q&A which I’m still thinking about whether or not I should do (probably might for competion’s sake), then I’ll get back on that thing I’ve been meaning to work on for SeiAni January, and then I’ll go back to this issue of VOICE Channel for… something else. No real schedule for releases though (’cause I’m bad at keeping true to those), so I’m just laying out what I plan to do in the hopefully foreseeable future. This entry was posted in Feature Translation and tagged aida rikako, aqours, りきゃこ, english, 逢田梨香子, japanese, rikyako, sakurauchi riko, translation, voice channel by Leap250. Bookmark the permalink. again, i love the interview. it doesn’t feel stiff and strict. It’s more casual and unguarded, even though there is still some ideal concept being played upon here. I think, as time goes on, she’s being more and more herself too (or at least she sounds more comfortable with how she answers with each interview), but yeah, the “ideal” is still there.